Susan Swartz is a talented American painter of nature. What, I ask challengingly, is left to say about landscape in the 21st century? Landscape is not dead as an art subject in 2012. But it is surely close to exhausted. Mere imitation of nature went over to the camera around 1860. Paint has continued to imagine, fantasise and brilliantly lie--but landscape? The sublime, the picturesque, Impressionism, Expressionism, Romanticism, flattened perspectives, three dimensions, Turner, Monet, Van Gogh, Cezanne, Kandinsky, Richter, Hockney and Glenn Brown, it has all been done — hasn’t it? Susan Swartz, who lives opposite water in Martha’s Vineyard, Massachusetts and forests and mountains in Park City, Utah, gives a strongly personal reply. She says she feels compelled to paint nature because she sees in it a divine hand and a transcendent beauty and a reason to be glad to be alive. That’s why she turns to nature. She is also alarmed at the destruction of the planet and seeks to remind by a deliberate beauty in what she paints just what it is that we are demolishing. No oil slicks in her art, just beauty. The artist’s job is to look beyond the horizon and see what less visionary people do not see. What is Susan Swartz seeing that you and I might miss? She began painting in the dense forests of Pennsylvania then Utah, the state of mountains, desert and weird rocks which look like dice rolled around by a giant hand. Awe and wonder rise easily there amid the magnificence of nature and Susan’s art is one that appeals to the moral faculties and to feelings for the elemental and divine. She sees in nature “as it were a soul,” in Van Gogh’s words. Yet the soul in Susan Swartz’s pictures evokes not only reverence and awe before Nature and a sense of the eternal but often feelings of fear and alarm – fear sometimes vague, sometimes explicit. A brooding mystery invades many of her works. Gerhard Richter decided in the 1950s and 60s that nature is a false friend with a smiling face; by flood, avalanche, lightning, ocean, famine and disease it convulses the lives of innocent people. Are there allusions to a darkness in nature in Susan Swartz’s haunting landscapes too? Susan denies it, and hers must be the last word. Ten years ago I became quite ill and entered a desperate place in my soul. I had mercury poisoning and then Lyme’s Disease” (an infection from deer and rodent ticks which when unrecognised attacks the nervous system and threatens life. Susan was too weak to hold a paintbrush). 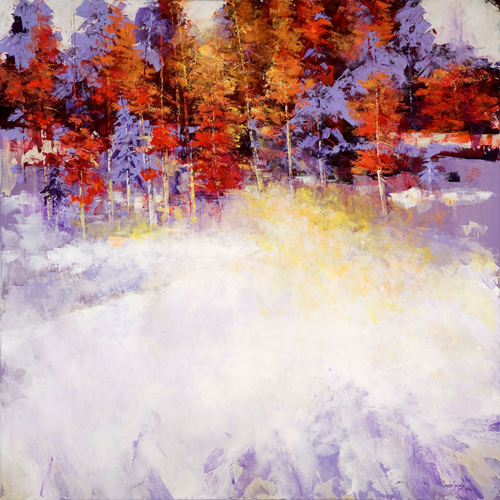 But visibly in her art, many of her paintings in the last ten years have been strong on silence, on foreground space and on waiting, and in images like Summer Day, Red Vibrance, Purple Grandeur, Forest Edge and Amazing Grace their large abstract spaces have not been welcoming or inviting but unsettling and in some works unenterable. Paintings of aspen and birch trunks hint at surprise and fright behind; routinely they bar the viewer from further passage. Where the forest is seen from a distance in Harvest Passion and Golden Aspens II, bright sunlight hangs over ominous shadows within the trees where Hansel and Gretel would hesitate to venture by day, let alone by moonlight. In Vista there is a sense of imminent danger, in Nature’s Grace and Forest Edge a foreboding. A violent acrylic blood red landscape is titled Morning Calm by Susan. It is anything but calm. Those pictures, perhaps more related to the traumas of her illness than she recognises, are behind her. The 2011-12 new works on exhibition this month at Belgravia Gallery are more abstract, more joyful and to my eye as strong anything since what seem to me her masterpieces, Afterglow and Crimson Reflections (2007). A group called Winter Hush is inspired not by America but by snow at Knole in Kent. Her visual tricks continue. She uses spaces, barriers and dislocations to create her effects. She unhesitatingly distorts what the viewer truly sees and in doing so, disorients. One repeated disorientation is to her tree trunks, subtly tilted from the vertical to heighten the sense of an unreal world – a device she presumably learned from Winslow Homer. “My pictures demand that viewers question their own relationships with the natural world,” she asserts. She is far from the only American landscaper to play these spatial tricks but her art is no imitation of nature or reheated Impressionist soup. She creates a natural world personal to her. Perhaps that statement answers the question with which I begin. It is when an artist finds a personal language and the craft to create in paint what she thinks and dreams that she has truly found a voice – and found with it something fresh and individual to say on the ancient subjects of nature and landscape. I am impressed by all I see.